Location. 39° 43.644′ N, 75° 32.601′ W. Marker is in Wilmington, Delaware, in New Castle County. Marker is at the intersection of New Castle Ave. (Delaware Route 9) and C Street, on the right when traveling north on New Castle Ave.. Touch for map. 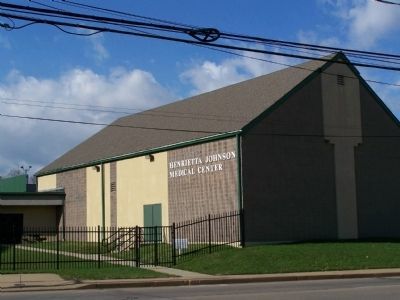 Marker is in this post office area: Wilmington DE 19801, United States of America. Touch for directions. (approx. ¾ mile away); Frank Furness Railroad District (approx. ¾ mile away); Anthony - Delaware's First Known Black Settler (approx. 0.8 miles away); Fort Christina National Historic Landmark (approx. 0.8 miles away). 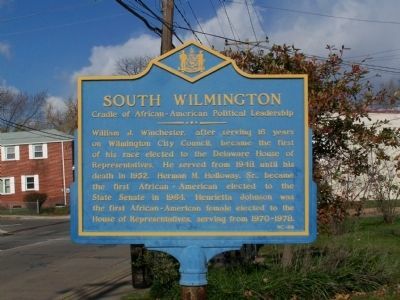 Touch for a list and map of all markers in Wilmington. More. Search the internet for South Wilmington. Credits. This page was last revised on February 27, 2019. This page originally submitted on December 5, 2008, by Bill Pfingsten of Bel Air, Maryland. This page has been viewed 1,008 times since then and 10 times this year. Last updated on February 25, 2019, by Carl Gordon Moore Jr. of North East, Maryland. Photos: 1, 2. submitted on December 5, 2008, by Bill Pfingsten of Bel Air, Maryland. • Andrew Ruppenstein was the editor who published this page.